That Diet Coke in your hand didn’t invent itself. It’s the result of years of focus groups, surveys and data crunching—more commonly known as market research. Companies that produce consumer packaged goods (CPGs) spend millions each year on market research and it’s both a blessing and a curse. It’s a boon to planning new products and tweaking existing ones but when it comes to finding individual pieces of information, that’s where the cursing comes in. A startup out of Chicago called KnowledgeHound thinks it has the answer. Zuhlke experienced this firsthand in her time at Procter & Gamble working in consumer insights. “As soon as we’d get the info in, a month later we’d forget we had it. There wasn’t a central, easily navigated place to access.” Building on her experiences in the consumer packaged goods industry, Zuhlke founded KnowledgeHound in 2012 and went from paper to product in four months. Her first customer? Procter & Gamble. Calling themselves “the Google of market research,” KnowledgeHound’s technology enables Fortune 500 companies to use, re-use, and recycle the consumer and market knowledge on which they spend an average of $60,000 per study. 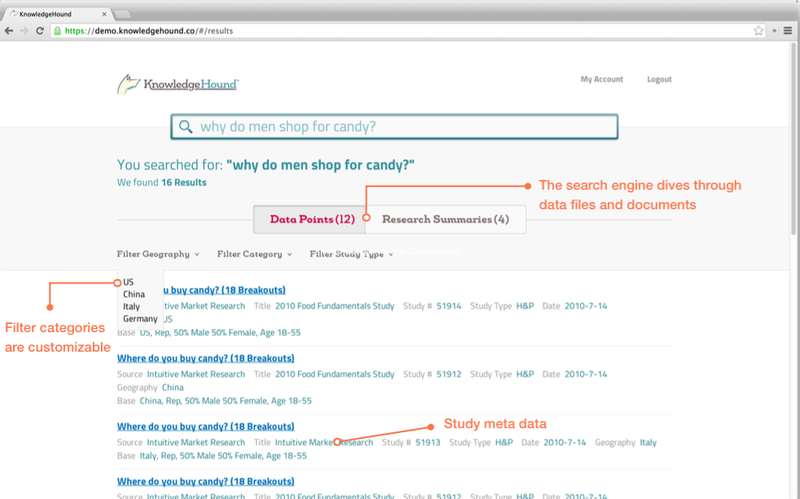 Instead of living on individual hard drives, which makes it unsearchable to the company at large, the data and research from each study is imported into the KnowledgeHound database, then augmented with a custom search engine and visualization tools. 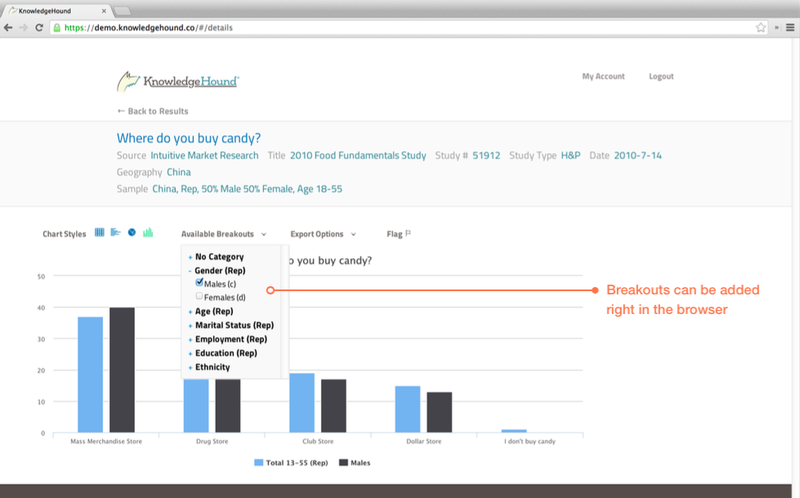 Results are modeled on a right brain/left brain approach when presented to the user, with research summaries representing the right and data points the left. “Where we’re really different is the left side of the brain, the data points,” Zuhlke said. The search engine looks through questions as they were asked in the study, takes the raw data, and transforms it into graphs and charts in milliseconds. Otherwise, the choice of tools to parse a company’s market research is all over the map. There is a thriving DIY community around visualization that focuses more on the research agencies that produce the studies. This puts the onus on the producer of the data to present findings in the way they think the client will need; a short-sighted solution that likely comes up short once it makes its way to the client. And occasionally, you’ll find a CPG company with a corporate librarian to help employees find the data they’re seeking. But those are rare. Angel-funded but also generating revenue, KnowledgeHound aims to hire 10-12 more employees in 2015 to help add to its customer base – Fortune 500, privately held, billion dollar companies – in addition to moving into the medical research space and launching new technologies in the next 6-9 months. Market research around CPGs is not going to be the next big thing in Silicon Valley. It’s wonky, niche-y, and involves a lot of dry data. But its target market is one of the largest industries in North America, valued at approximately $2 trillion. KnowledgeHound seems poised to take the lead, if it can attract the talent and resources needed to keep billion-dollar brand giants happy.